Dodge Data and Analytics recently released its 2016 Dodge Construction Outlook, which is a key resource for industry professionals across the US and helps drive sales forecasting and business planning efforts. The report predicts the recent resurgence will carry on unabated, with total US construction starts for 2016 expected to rise 6% to $712B. This would extend a positive trend over the past few years, coming on the heels of a 9% jump in 2014 and an estimated 13% upswing in 2015. Much of the gains over the past 12 months can be attributed to the start of several large liquefied natural gas terminal projects as well as a strong performance from the residential sector. 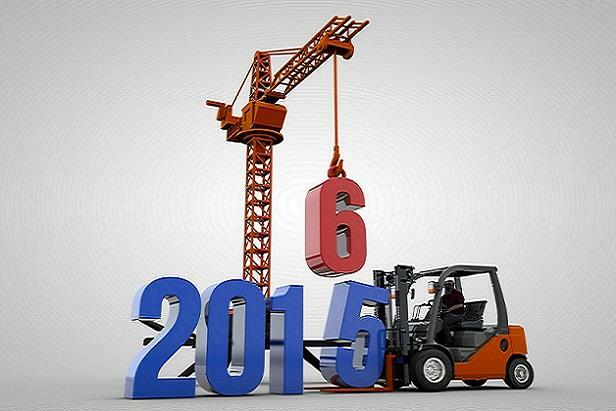 Broken down further, predictions for 2016 encompass increases in residential building (16%) and nonresidential building (9%), while the nonbuilding sector is projected to decrease 14%. Residential: Chief Economist for Dodge, Robert Murray, is optimistic that residential construction will be a key contributor to the health of the industry as a whole, with single family housing leading the way. Access to home mortgages is improving and decreases in unemployment will inspire more citizens to purchase houses in 2016, resulting in a 17% increase in starts (805K units) and a 20% rise in dollars to $224.8B. Multifamily housing will experience less robust growth but will continue to progress with 5% and 7% jumps in dollars and units, respectively. Institutional: Rising 9% to $120.3B, institutional construction will be led by transportation terminal projects (+17% starts and 24.8M sq. ft.) spurred by various public-private partnerships and expected infrastructure funding from Congress, amusement/recreational buildings (+15% and 52.7M sq. ft.) driven by continuous improvement in the economy, and educational construction (+9% and 138M sq. ft.) generated by expanded enrollment and demand for new facilities. Dodge predicts modest gains for public construction following eight consecutive years of decline, forecasting a 3% increase in starts and the addition of 15.9M sq. ft. of courthouses, police/fire stations, and other administrative offices. Starts for religious buildings are also anticipated to grow by 3% (9.6M sq. ft.) based on recent upswings in charitable giving. 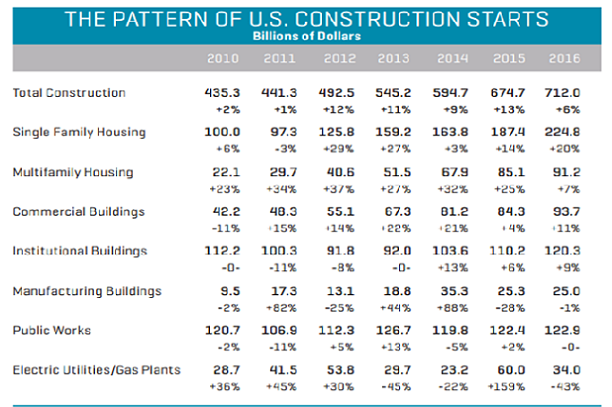 Healthcare construction will essentially remain stagnant, with a 1% bump in starts estimated and 69M sq. ft. added. Manufacturing: The recent decrease in oil prices delayed or stopped several energy-related projects in 2015, leading to a 22% reduction in starts and a 28% drop in dollars spent. However, Dodge believes oil prices will stabilize and create a mildly improved climate for manufacturing construction to drive starts to expand 5%, which will add 63M sq. ft. in production space. Spending will ultimately fall short by approximately one percent, contributing $25B to overall construction economic performance versus $25.3B in 2015. Public Works: As a whole, the public works sector looks like it will remain flat at $122.9B in total spending. Delving further into the numbers shows clear winners and losers within key public works segments such as environmental projects and highway/bridge construction. Environmental programs spanning dam and water resource building as well as sewer construction are expected to deliver slight growth in 2016 (+4% and $35.1B). On the other hand, highway and bridge projects are supposed to decline by 4% to $62.8B due to the fact that Congress has been unable to agree on a long-term solution for the Highway Trust Fund. Dodge’s analysis also noted that even if leaders in Washington finalize a deal for multiyear funding, that money will not reach projects immediately.